The accident is a new form of warfare. It is replacing revolution and war. Sarajevo triggered the First World War. New York is what Sarajevo was. September 11th opened Pandora’s box. The first war of globalization will be the global accident, the total accident, including the accident of science. And it is on the way. In 1968, Virilio abandoned his work in oblique architecture, believing that time had replaced space as the most important point of reflection because of the dominance of speed. We were basically on the verge of converting space time into space speed… Speed facilitates the decoding of the human genome, and the possibility of another humanity: a humanity which is no longer extra-territorial, but extra-human. 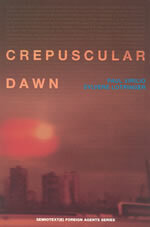 Crespuscular Dawn expands Virilio’s vision of the implosion of physical time and space, onto the micro-level of bioengineering and biotechnology. In this cat-and-mouse dialogue between Sylvere Lotringer and Paul Virilio, Lotringer pushes Virilio to uncover the historical foundations of his biotech theories. Citing various medical experiments conducted during World War II, Lotringer asks whether biotechnology isn’t the heir to eugenics and the “science for racial improvement” that the Nazis enthusiastically embraced. Will the endocolonizataion of the body come to replace the colonization of one’s own population by the military? Both biographical and thematic, the book explores the development of Virilio’s investigation of space (architecture, urbanism) and time (speed and simultanaeity) that would ultimately lay the foundation for his theories on biotechnology and his startling declaration that after the colonization of space begins the colonization of the body. Paul Virilio was born in Paris in 1932 to an immigrant Italian family. Trained as an urban planner, he became the director of the École Speciale d’Architecture in the wake of the 1968 rebellion. He has published twenty-five books, including Pure War (1988) (his first in English) and The Accident of Art (2005), both with Sylvère Lotringer and published by Semiotext(e).